Howdy friends:) It's been such a long while since I've done this type of round-up post! 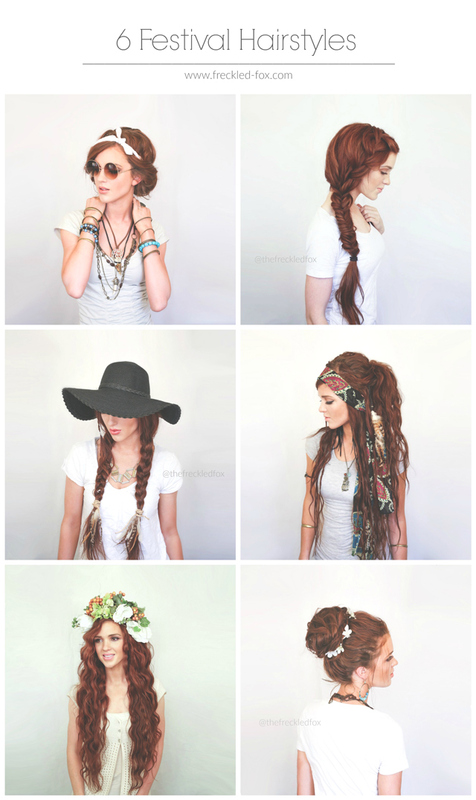 I'm still having a hard time accepting that it's April already, but now that festival season is starting I've been getting tons of questions about my boho hairstyles from a couple years ago, and lots of requests to make them into youtube videos. So I thought that it'd be fun to not only put them all together into a little post for easier access, but I also want to ask, which you would like to see a video tutorial of first? I hope you have fun plans for the rest of the month, and I'll be back here tomorrow! #2 or 4. 4 is my favorite. I love the 2nd and 3rd hairstyle the most! Lovely dear Emily! You're so creative and inspirational! looking forward to the youtube tutorials! I'd love to see a video of the side braid/fishtail braid. My daughter wants this hairstyle and I havent been able to figure it out from picture tutorials I have found. Thank you!! I LOVE number four! Your hair is seriously beyond gorgeous. The Bohemian is my all time favorite. I would love to see a video of this hairstyle. The fishtail braid! But...my question is what haircare do you use? And how did you get it to grow long and healthy? Definitely number four! I've loved that one, but have never had hair long enough for it. :) My friend has hair literally almost as long as yours, and I want to do it on her... Thanks!! #4!!! I've been wanting to know that one for ages! I love your hair tutorials and can not wait for them to come back! #4! I attempted it last summer but it...well, it looked like a disaster.... I love the boho syles and can't wait for reasons to play around with them! Can you suggest a good dry shampoo? My fav dry shampoo was discontinued and I used it everyday to give my hair more hold,texture and volume. I haven't had any luck finding a good replacement.